With all Mahindra & Mahindra brands getting their share of digital spotlight, Club Mahindra couldn’t be caught holidaying. 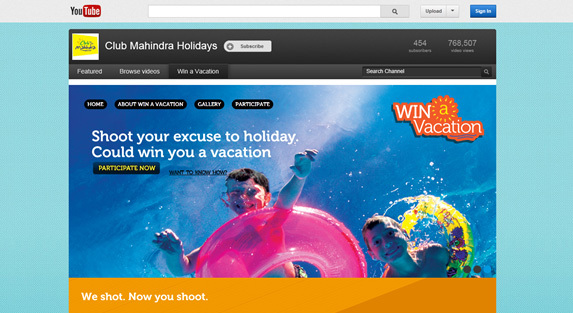 The vacation provider is promoting its cool new Youtube 'Win a Vacation' contest app. The promo aims to engage end users by getting them to share self-created video content. Users need to shoot their excuse to take a break, upload it on Youtube and enter the video into the contest. If the excuse is quirky and fun, they stand a chance to win a free vacation. I could use one right now! I love the transitions and quality of imagery used throughout the promo. The copy is great and there are some pre-populated videos to give users a sense of what they should upload. Check it out. On a separate note, do video upload promos work? I am still a sceptic simply because I have rarely seen great content coming through from user uploads on brand contests. Graphics and its presentation makes this promo enticing in terms of web browsing experience. I think the same approach can be used for promotional items and other niches.